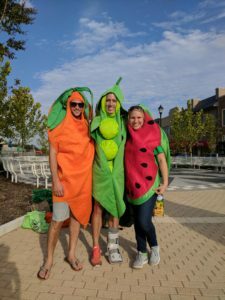 A recent event held in Riverdale Park, MD, highlighted the great work that Food Recovery Network (FRN), a Network Depot client, has been carrying out to help in the fight against hunger and food waste. The Whole Foods Market in Riverdale Park selected FRN as the worthy recipient of their Community Giving Day on August 31. As a result, FRN received 5% of the store’s total sales that day to help support their worthwhile mission. FRN was founded when students at the University of Maryland, College Park first realized the huge amount of food waste that was occurring in their dining hall and decided to do something about it. The organization’s mission is to educate people about the significant problem of food waste in this country and to actively combat it on college campuses. FRN emphasizes the paradox that while one in six Americans suffers from food insecurity, 40 % of the food produced in the US ends up wasted in landfills. In Prince George’s County alone more than 128,000 people or 14.4% of the population suffer from food insecurity. To combat this significant problem, FRN recovers surplus food from campuses and local restaurants and donates it to feed needy people. Their organization has grown to an impressive 230 chapters in 44 states and DC. Since their founding in 2011, FRN has recovered and donated more than 2 million pounds of food. The 5% Day at the Whole Foods Market featured a wide range of events including food demonstrations, free food samples and package giveaways, speakers from local government and community organizations, interaction with costumed food mascots, live music, face painting, and other family activities. Members from Network Depot’s leadership team were happy to volunteer and support FRN in educating event attendees about their important mission. 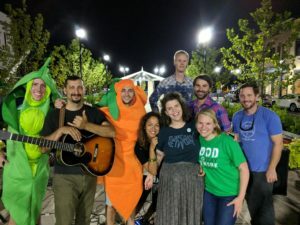 FRN’s leadership, including Regina Northouse and Annie Lobel, were excited to see this impressive collaboration among the private sector, non-profits, and the local government all united in an effort to fight food waste and hunger. They look forward to replicating the success of their local efforts in Prince George’s County with similar partnership events around the country. Network Depot applauds Food Recovery Network and Whole Foods Market for their noble fight against the formidable problem of food waste and hunger in our community and throughout our country. To help start a student chapter at your local university, partner with FRN, or for more information please go to foodrecoverynetwork.org.